Let’s look at this concept of responsibility. When we feel a responsibility towards something or someone we feel obligated and can feel guilty or shame when we don’t measure up or perceive ourselves as a ‘failure’! I remember working at the Government and feeling the heavy weight of ‘responsibility’ towards colleagues, staff, clients and society as a whole. Then I would examine my anxiety around the responsibilities toward family obligations and even cleaning (as I have allergies with dust so cleaning would create other problems). This concept I had over ‘responsibility’ was way too dense and heavy energetically. I would begin to feel anxious at any hint of responsibility … until I figured it out and then I began to understand that it was my perceptions of responsibility that was to blame and not my work, family and home that was the problem. And I thought I had shifted it; clarified my relationship with responsibility. However, when Emmanuel was sharing our perceptions around financial freedom and that it is our fear of responsibility that is causing the blocks – I remembered my earlier understandings and realized that responsibility still plays a HUGE role in my fear around financial freedom. I look at Income Tax and specifically HST as a block – which is a responsibility that I don’t want. However I also feel responsible to my clients, my listeners and the audience of my website. When something goes wrong I feel responsible for it. Responsibility is a heavy burden that blocks us from living a stress free life. Emmanuel suggests that the only responsibility we have is to our Soul/Heart/I Am Presence and making our Sacred Self happy and expressing what It wants. Everything else is just irrelevant and noise in our life that blocks us from experiencing Unconditional Love and Acceptance. Now bring in our ‘Fear of Failure’ and ‘Responsibility’ and we see that they play a BIG role. Responsibility pushes us to DO what society or our own guilt and shame believes is ‘right’ and when that doesn’t happen or because we want to be ‘socially acceptable’ this triggers Fear of Failure. As a core fear, Failure/Success or Right/Wrong are intricately ingrained in Fear of Failure. This Fear of Failure is also ingrained in our Ego and in our mind’s attempt to control us, it pushes us to ‘do’ things – to fix, heal or manipulate our environment – it’s a fear we create where we perceive we aren’t successful or fear our own success as it all culminates in Fear of Failure. It is an interesting slide into propagating a core fear – Failure. We perceive so many things – including relationships – as Failures yet nothing is a failure from our Highest Perspective. 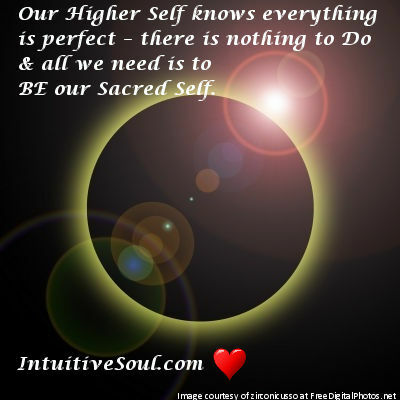 Our Higher Self knows that everything is perfect – that there is nothing to Do and all we need is to BE our Sacred Self. Yet how do we get to the place where we can understand how our fears wiggle into our minds and block us from expressing the Essence of Who we Are? We often don’t even see how core fears impact us. When I thought about failure I would not see that I feared failure because I felt successful in what I do. I feel so blessed that I can do what I love and no longer fear basic survival needs being met. However, if I look at ‘responsibility’ along with ‘Failure’, I can see that Fear of Failure is alive and well. It lies underneath where I haven’t allowed access consciously. Yet now I see it everywhere and showing up where it is unexpected. They say you are never given anything you can’t deal with but what happens when you don’t see it? Unfortunately the fears don’t go away because you don’t see them. And of course if we are serious about Growing Up then when we are ready teachers or teachings come into our lives to help us understand ourselves better and uncover our fears. Our Higher Self knows that everything is perfect – that there is nothing to Do and all we need is to BE our Sacred Self. I invite you to begin to recognize when you may have a fear hidden in your unconscious waiting to become conscious so that you can work with it. Peace Mother offered a wonderful tool when helping us observe our fears – by making lists of people or situations that still hold energy that is unloved within us. For as long as I can remember I get upset when things don’t go the way I wanted, my fear of Responsibility showing up, and this is because I have felt betrayed by teachers and anyone who should provide reliable service. It was my fear of being betrayed and disappointed due to my own fears around Responsibility. Peace Mother suggested creating lists of people and situations that still hold some energy and pray, bless and find forgiveness for each one. I believe part of the dilemma we have is that we don’t always know what fears we have and how the core fears – Fear of being alone, Fear of Failure, Fear of losing something (death), and Fear of the Unknown – are underlying our thoughts and feelings and are unconscious within us. I invite you to find a way to check in with your Sacred Self and ask what our Higher Self/Soul really wants instead of what our ego wants. My Heart to Yours. This entry was posted in Blog and tagged Core Fears, Emmanuel Dagher, Failure and Responsibility, Fear and Ego, Laurie Huston, love vs fear, Peace Mother, Peace Mother Geeta Sacred Song, Tom Campbell. Bookmark the permalink.